(Jerusalem: ATID Press, 2004), 96 pages, softcover. "Stirring poetry from a leading Orthodox educator... The poetic outpouring of a Torah teacher's soul." This collection of original poetry on Jewish and religious themes will enlighten and stimulate readers to an array of issues-Jewish learning and teaching; textual understanding and interpretation; prayer, salvation and repentance; and the Holocaust. 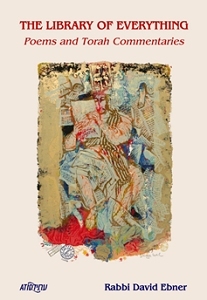 Each of the twenty-one poems is accompanied by a short essay, notes, or an excursus, through which the author unfolds the genesis of the poem: how it was distilled from classical Jewish sources, or-moving in the opposite direction-drawing the reader's attention to implications and applications of the poem to contemporary religious life and experience. In a powerfully polemical introduction, the author draws on decades of experience in Jewish education to argue that poetry holds the potential to sensitize us in ways that will elevate and enrich Torah study, prayer, and a sincerely engaged Jewish life. Diaspora. He is presently in the process of helping to establish Yeshivat Eretz HaTzvi, and completing a curricular project for ATID on integration between Jewish studies and English literature. In the one place that Torah gives itself a name-the commandment incumbent to write a personal copy of the Torah (Deut. 31:19)-the Torah calls itself a sefer shirah-a book of poetry, a song. Thus, in order to pray and learn Torah one must know far more than the translation of words. One cannot understand prayer or pray without a sense of the poetic. Lacking this capacity, neither the words of Torah nor prayer have true spiritual weight or significance. They point to nothing greater or transcendent and become a ritual of "specialists without heart." On the other hand, once this talent is developed, all is transformed in one's experience of ecstasy and transcendence in becoming a fount of prayer and Torah. Torah and Tehillim, philosophy and prayer are all constructed as poetry and should produce Jews whose sense of language, its magic and wonder, is incredibly refined. Two directions might be taken to address this issue. First, materials should be developed which would aid teachers in presenting great poetry of the English language (or for that matter, the Hebrew language) in such a way that it would speak to the soul of the religiously developing student. This is a path that we are working on in ATID and, hopefully, integrative source materials will soon begin to appear designed for both limmudei kodesh and literature teachers. In addition, it is hoped that this small volume will spur others to take up the task. The selection of poems herein generally reflects sentiments and arguments presented in this introduction. They are the davening after the davening, and the hiddushei Torah after the peshat. I have specifically limited the selection of poems to those that fit this mold and which I would feel comfortable reading and teaching in a yeshivah high school or adult education context. Indeed, it has been my experience that one way to address the English-speaking Jewish community on this issue (a fundamental one for the religious spirit), is the public reading of poetry that is intimately bound to its religious life. I have learned that while the Orthodox public generally avoids poetry, it is often greatly moved when it is woven into the context of a lecture or discussion. This would represent a new direction in education, one that distills the lessons of "formal schooling" to the level of poetry; the mode in which the Torah and tefillah are grounded. The fact that the author himself or herself can discuss the work with the class or audience and give them encouragement to write their own prayers and meditations on Torah might serve to encourage new depths of appreciation for the religious life. And perhaps that is sufficient apology for one who is zeira de-min havraya in the worlds of Torah and poetry. Be-makom she-ain anashim, hishtadel... It is my prayer that I will be followed by men and women who are true Torah poets, who are writing poetic commentary on God's poem.